Ingredients are texturized and cooked through a combination of heat, mechanical shear and moisture addition. A co-extrusion die then produces a single stream of product with two components – a cereal outer and a centre-filling. Stores and supplies cream to the co-extrusion die. 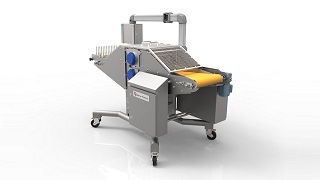 After leaving the die, a pressing roll ensures streams are the correct thickness. They are then separated and spaced before two rollers with multiple blades pinch streams along their lengths to form continuous strands of sealed pillow shapes. These are dried and broken into individual pieces. 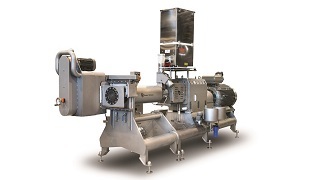 A standard Snack Master™ system comprises an SBX Master™ extruder, dryer and flavouring system to make a range of direct expanded products. 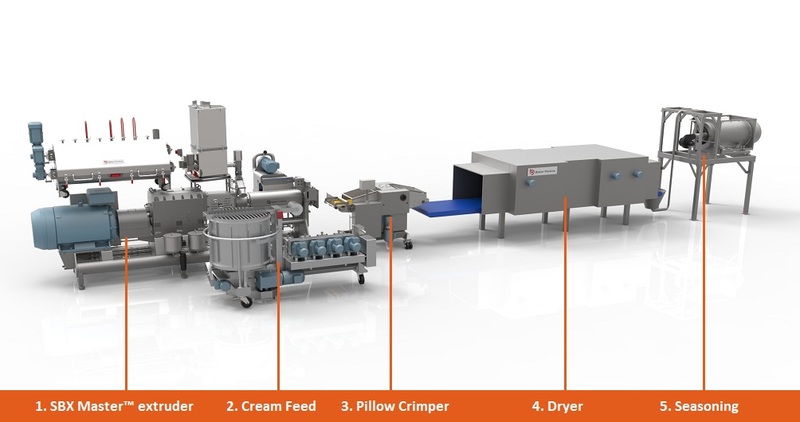 The addition of Baker Perkins' CoEx Master™ Co-Extrusion System transforms the output of the SBX Master™ extruder by enabling a sweet, savoury or fruit centre filling to be added to the extrudate before it is shaped into pillows, tubes, bars or wafers. The CoEx Master™ co-extrusion system can be added to any existing Snack Master™ system to provide the means of incorporating fillings with contrasting textures and colours into a cereal outer. It provides a capacity for making added-value products with out-of-the-ordinary shapes that catch the eye, complemented by exotic flavours and fillings. Fillings can be of virtually any colour or flavour – sweet and savoury creams, fruit pastes, cheese and chocolate praline are typical. Exotic flavours, plus glazings, frostings or chocolate coating, add even more appeal. A further avenue for investigation is the development of surface textures such as grooves and highlights. 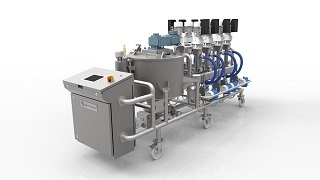 Another option makes lighter products by either partially filling or using a special die to inject air. 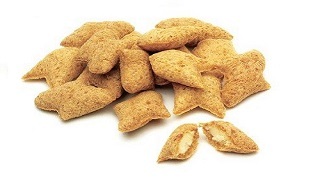 Co-extruded products can be positioned as cereal, pet or infant foods as well as mainstream snacks. 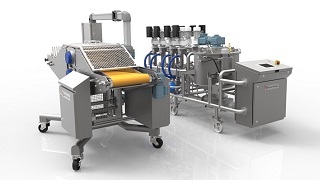 In addition, to position co-extruded products as a more indulgent option, bite-size sweet-filled pieces are already emerging to challenge the chocolate bar. Co-extruded products can be made in virtually any length from 12 to 120mm, so filled bars can be marketed as individually wrapped count lines. Production with a co-extrusion system is versatile as key parts can be changed over quickly. 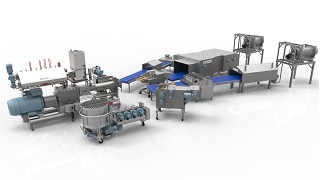 Investing in a Baker Perkins CoEx Master™ system is an economical means of expanding marketing opportunities as well as a product range – with minimal investment in R&D.